Iowa is a Midwestern state famous mostly as an agricultural center. The Hawkeye State is said to produce 10% of the nation’s food supply, mainly in the form of corn and soybeans. Far from just the bread-basket of the nation, Iowa is also something of a modern hotbed of gambling. Iowa was among the first US states to re-legalize riverboat gambling, opening its first riverboat gambling venue in 1991. These days, Iowa is home to eighteen casinos, which should be an indication that the state is friendly to sports bettors, right? Unfortunately, sports betting is one of the only forms of gambling not explicitly allowed in the state’s penal code. The state government of Iowa is not one of a handful of US states with an express prohibition against Internet wagering, so sports bettors are pretty safe turning to online sportsbooks to get their fix. Please be aware – I’m not lawyer, I never went to law school, and I know just a tiny bit about Iowa law, having researched it for this article. If you are looking for legal advice specific to the Iowa market, you should contact a lawyer, ideally one with experience in gambling law in your state. 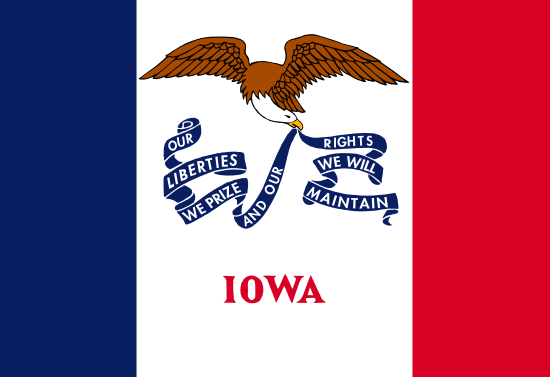 • The Iowa Cubs play AAA baseball in Des Moines, the state’s largest city. They are one rung down from the Chicago Cubs, professionally, and are the best-known and most popular sports team in the state. • The Sioux City Bandits play in the Indoor Football League. • The Cedar Rapids Titans also play in the Indoor Football League. • The Iowa Wild play minor league hockey games in Des Moines. The Wild are members of the American Hockey League, and are a part of the Minnesota Wild farm system. • The Iowa Energy are an NBA Development League team in Des Moines. • The Quad Cities Riverhawks are an NBA Development League in the Quad Cities area. • The University of Iowa is home to the Hawkeyes. The school is located in Iowa City and plays all sports in the NCAA’s Big 10 Conference. Iowa is probably the flagship school in the state, enjoying some national success in football and basketball. The Hawkeyes have made it to eight bowl games in the past decade, including winning a major BCS game, the FedEx Orange Bowl in 2010. • Drake University in Des Moines is home to the Bulldogs. A total of eight men’s and ten women’s teams from Drake compete in NCAA sports: basketball, football, crew, track and field, and other events Drake competes in the Missouri Valley Conference but has had little national success to speak of. • The Iowa State University in Ames, Iowa is home to the Cyclones. Iowa State competes in the Big 12 conference in all sports, having earned two conference titles and one division title during their time in the conference. Iowa State has had more recent success in men’s basketball than any other Iowa-based school. • The University of Northern Iowa in Cedar Falls is home to the Panthers. UNI has made the most noise in the NCAA tournament (more details below), but is also a force in wrestling. The 2013 UNI wrestling team became the first D1 school in history to go undefeated in wrestling. By the time the NCAA Tournament premiered in the late 1930s, Iowans had been playing organized basketball for four decades. The state has a long tradition of producing basketball powerhouses and great basketball thinkers, though a shift in power to the south and east means that modern basketball has all but left the state behind. Since brick and mortar sportsbooks are not available in Iowa, if you want to bet on any of your favorite teams within the state’s borders, opening an account at an online sportsbook is your easiest option. Choose your site carefully, paying attention to any available Terms and Conditions regarding their promotions and what their procedure for dealing with American customers is. Sometimes special fees or withdrawal processes must be met if you live in the United States. Iowa has long been a hotbed of sports activity, producing talented baseball, basketball, and football athletes at all levels, from amateur to pro and college. Many classic American sports include Iowa in their origin story, and the hard-working people of Iowa have long relaxed by gathering to watch local sports teams compete in semi-pro and amateur leagues. The state of Iowa has more than a few legal gambling options, thanks to a strangely-liberal attitude the state government has to games of chance and skill. However, this is still an American state, so legal sports betting is not available through traditional means. Wagering online appears to be legal and safe, by my reading of the state code, so I recommend that Iowans who want to bet on sports research and find a legitimate online sportsbook that accepts US players.